In February of 2014 we took a short trip to San Diego. 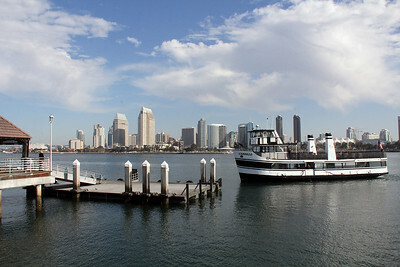 We stayed on Coronado island and took the ferry across to the city. 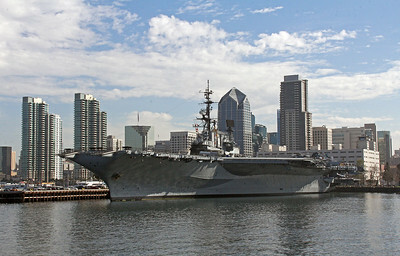 Our primary objective was touring the USS Midway, the retired aircraft carrier which is now a major tourist attraction. TO GET STARTED, CLICK ON THE FIRST, UPPER LEFT, SLIDE (black with pink writing) and read its instructions. Our ferry arrives at Coronado to take us across the bay to the city. The San Diego skyline as seen from our ferry. We will dock near the USS MIdway visible at left center. The USS Midway seen from our ferry. We will spend most of the day touring her. 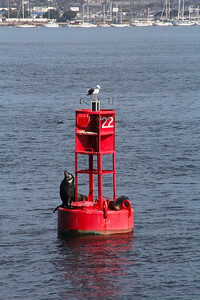 Two seals and a gull have a prime view of the city. Closer the the Midway not long before our ferry docks at a pier out of sight just to the left. 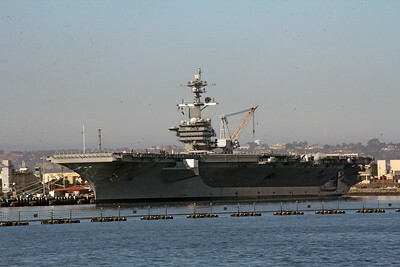 This shot, almost bow-on, shows how wide part of the carrier is. The bow, at left, is where planes are launched. The wide flat area at right is where planes are parked. 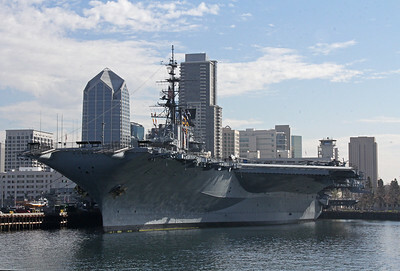 The USS Midway is a recent addition to the San Diego Maritime Museum which has a lot of interesting watercraft on display. 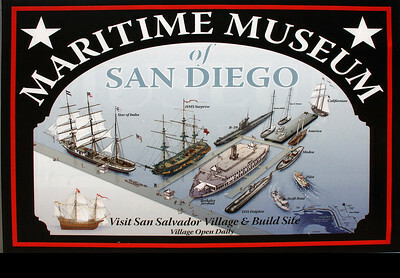 The Maritime Museum has a lot of different ships, from old sailing ships, to submarines, ferries, naval craft, etc. You can buy a ticket to tour them all. But the MIdway is a separate ticket and is the only one we toured. We need to go back some day to get a closer look at the rest. 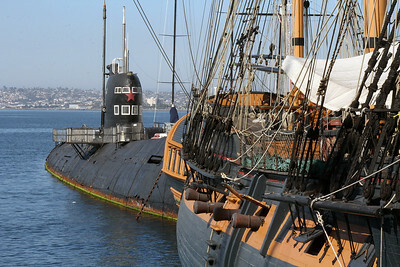 The HMS Surprise. The ship now known as HMS Surprise began life in 1970 as a replica of the 18th century Royal Navy frigate Rose. During the next 30 years Rose sailed thousands of miles as an attraction vessel and sail training ship prior to her conversion to HMS Surprise. 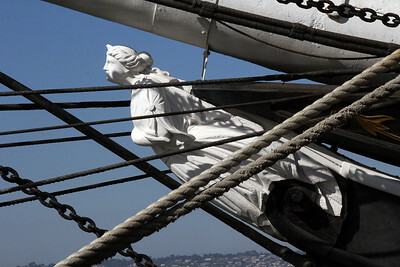 The figurehead on the bow of HMS Surprise. 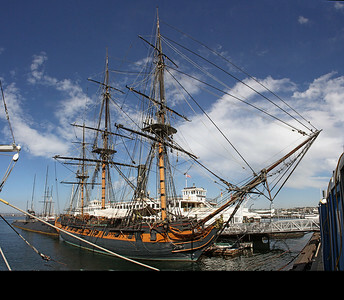 For the academy award winning film, Master and Commander: The Far Side of the World, the filmmakers made a painstaking effort to recreate a 24 gun frigate specific to Great Britain's Nelson era Royal Navy. A Russian submarine behind the Surprise. 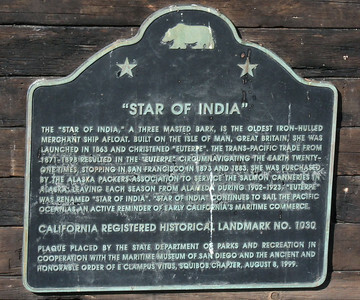 The Star of India was moored next to the street, and I couldn't get far enough away to get much of a shot of her. 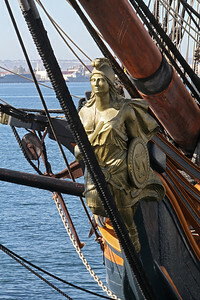 The figurehead on the Star of India. On the next dock ... not part of the museum ... was this Coast Guard buoy tender. Much like what I was on in Alaska, but much newer and far more modern in its technology. 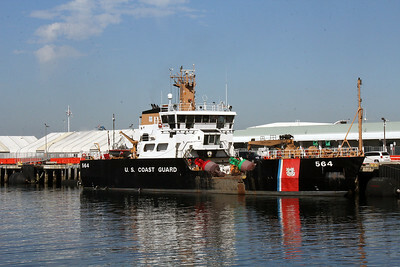 This is the USCGC George Cobb, 175-foot coastal buoy tender. 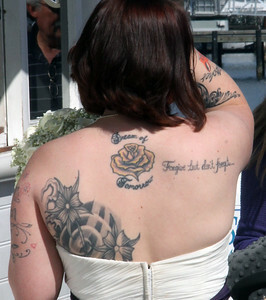 Some messages from a fellow tourist. USS Midway from the stern. Stern-on view. The deck above the ship's name is now a snack bar/restaurant for tourists. Port quarter view. From Wikipedia: "USS Midway (CVB/CVA/CV-41) was an aircraft carrier of the United States Navy, the lead ship of her class. Commissioned a week after the end of World War II, Midway was the largest ship in the world until 1955, as well as the first U.S. warship too big to transit the Panama Canal. A revolutionary hull design, based on the planned Montana-class battleship, gave her better maneuverability than previous carriers. She served for an unprecedented 47 years, having seen action in the Vietnam War and been the Persian Gulf flagship in 1991's Operation Desert Storm." 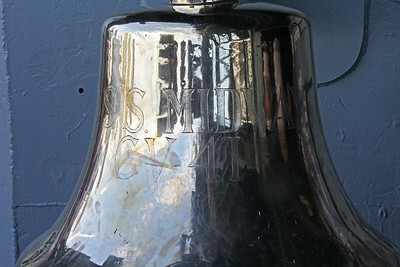 Ship's bell on the quarterdeck as you start your tour. 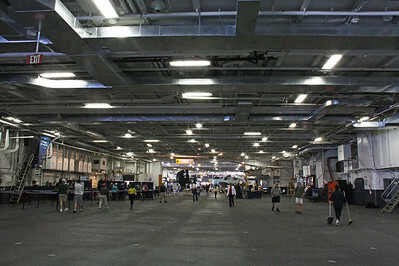 The tour starts on the hanger deck which is just below the flight deck.